← Cast aside all crippling fear. Believe in yourself. Be free. 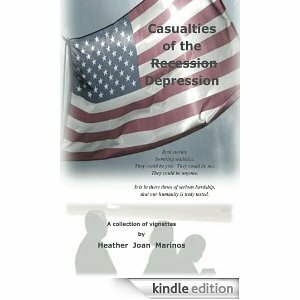 This entry was posted in Casualties of the Recession/Depression, non-fiction, short stories & vignettes (non-fiction) and tagged Amazon Kindle, Amazon.com, American economy, American Middle Class, Casualties of the (Recession) Depression, E-book, Ebook, Economic Commentary, economic condition, Heather Joan Marinos, homelessness, Hunger, joblessness, middle-class, Recession, United States. Bookmark the permalink.